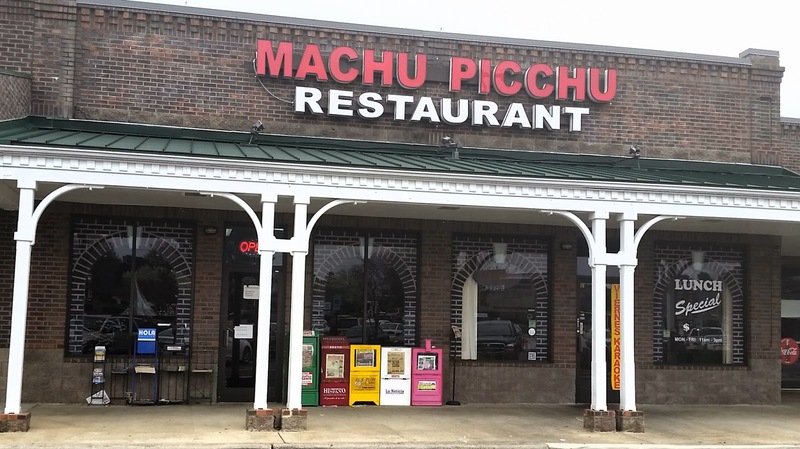 This edition of “Excited about Eating” takes us to Pineville to Machu Picchu, Peruvian Cuisine, named after the ancient Inca City near Cusco, Peru. Now I can truly say, I have never had Peruvian food, but I am always up for trying something new and my wife was in an adventurous mood. Dora here. Haha! Just inside, we noticed pictures of some of the menu items on the wall and a picture page was included with the menu. This was especially helpful for us to understand the menu. Dora here. I noticed something else. The pungent aroma of seafood. And the interior is quite dim. 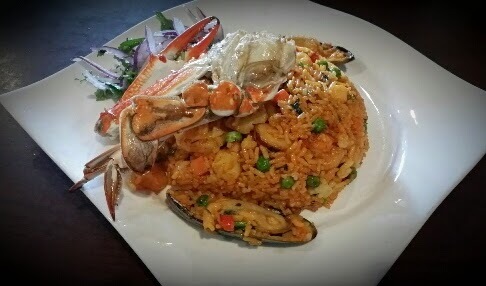 I chose the Arroz Con Mariscos which consisted of yellow rice cooked with an assortment of seafood, mixed vegetables and spices. This dish was very good, not too spicy but very moist and tasty, and packed with perfectly cooked seafood. It would have been great if they reduced the massive portion size and included one of the interesting side items from the menu like fried plantains or yucca. 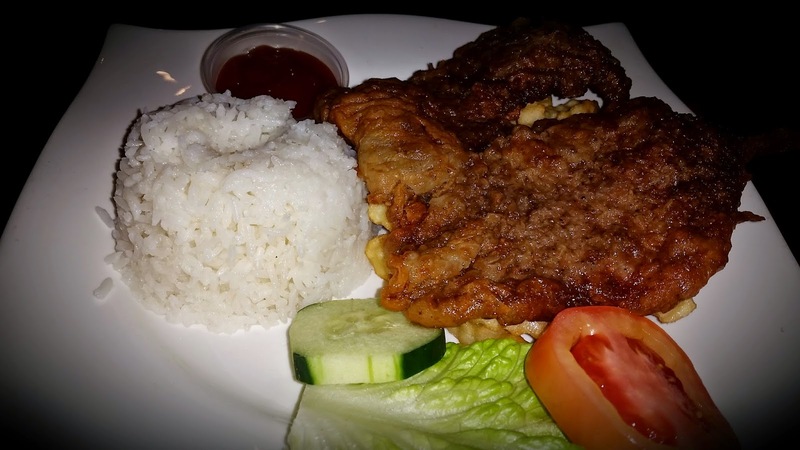 Dora ordered Bisteck Apanado, lightly breaded deep-fried steak served with white rice and French fries. The star of this dish was the deep-fried steak, which had the right amount of breading, juicy, and so good. It was strange that this dish was served with both white rice and French fries. Dora here. This steak reminded me of Palomilla steak, my favorite dish from when we lived in Tampa. Tender and tasty, and I’d definitely order it again! We opted for dessert instead of an appetizer this trip. 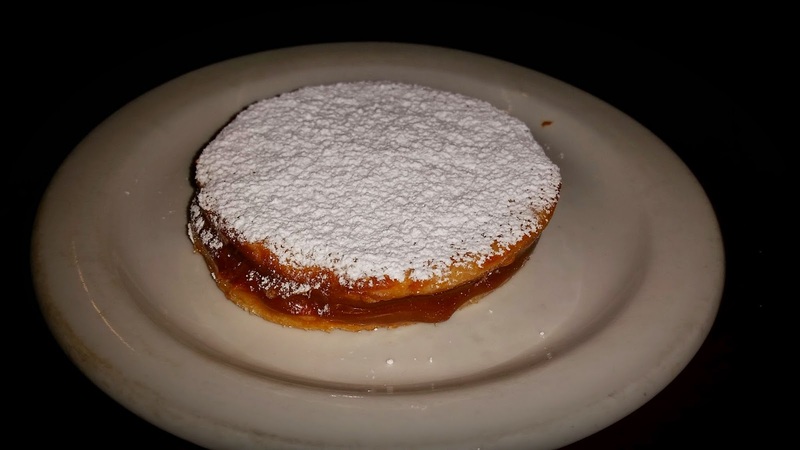 At our waiter’s recommendation, we chose Alfajores, two shortbread cookies with Dulce de leche in the middle sprinkled with powdered sugar. A nice way to end the meal, just the right amount of crunch and not sweet. The dessert case was full of them, so obviously they sell a bunch. I would rate this establishment 4 forks out of 5 for a family friendly restaurant serving great food. Have you tried Peruvian food? What’s your favorite dish? ← Excited about Writing: CALLING ALL BOOKWORMS! I once had Llama in Cusco, Peru when I visited Machu Picchu. I was in the Navy at the time. The meat was tender and had the taste of beef (steak). I loved it! I would have it again. Not sure they had Llama on the menu, but the seafood was great. If we every make it to Peru, I will have to remember to try the Llama.